Auxiliary Generator is a very vital part for EMD Locomotives manufactured by Indian Railways. It consist of one three phase pilot exciter assembly and is driven by main engine shaft through gear train. Its main function is to develop 74 VDC at all speed of engines required for battery charging which is used further for cranking the locomotives. This machine is a brushless AC Generator. 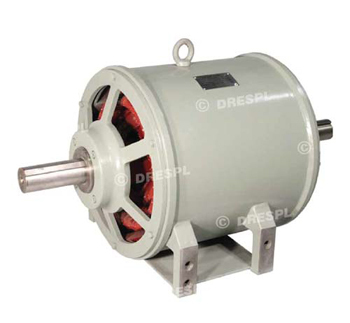 The generated voltage of the generator is rectified by 3- phase 6 wave diode system to produce DC voltage and is connected to the battery terminals. The nominal output is 18kW at 55VAC. The pilot fields are installed on common shaft and are the critical features of this machine.